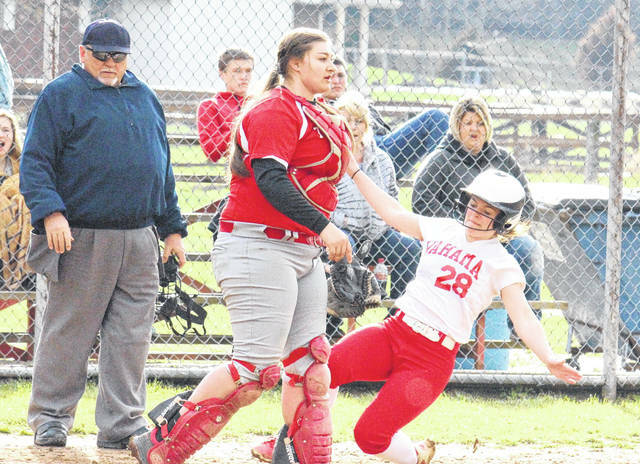 Wahama’s Grace Haddox (28) slides safely into home during the Lady Falcons’ 8-2 victory over Trimble on Monday in Hartford, W.Va.
HARTFORD, W.Va. — The championship defense has begun. 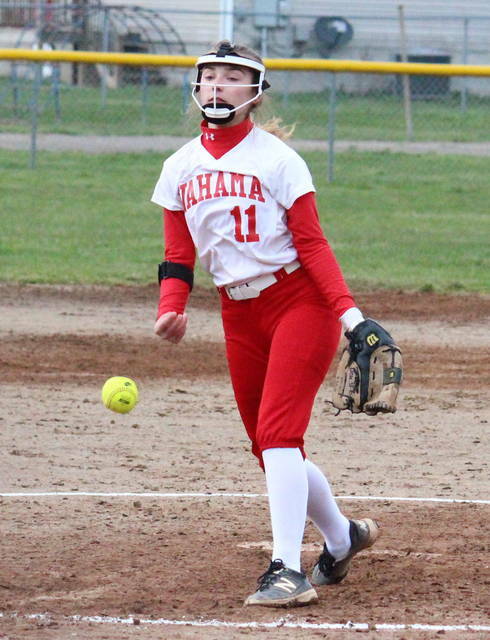 The Wahama softball team took the first step in its Tri-Valley Conference Hocking Division title defense on Monday evening in Mason County, as the Lady Falcons kicked off league play with an 8-2 victory over visiting Trimble. The Lady Tomcats took a 1-0 lead on a wild pitch in the top of the first inning. After being sent down in order in the second and third frames, Trimble went up 2-0 in the top of the fourth when Moore singled home courtesy runner Murphy. Wahama (4-1, 1-0 TVC Hocking) was retired in order in the first three innings, but broke through in the top of the bottom of the fourth inning. Leadoff batter Hannah Rose drew a walk, stole second, advanced to third on a single by Emma Gibbs and then scored the Lady Falcons’ first run. With two outs in the inning, Maddy VanMatre doubled home Gibbs, tying the game at two. Back-to-back singles by Hannah Billups and Logan Eades plated courtesy runners Grace Haddox and Kailyn Alison, giving WHS a 4-2 lead at the end of the fourth. The Lady Falcons added on to their lead in the bottom of the fifth, as Emma Gibbs singled home Rose and Victoria VanMatre, and then scored on a double by Emily VanMatre, who was singled home by Maddy VanMatre. The Lady Tomcats stranded a runner in scoring position in each of the final three innings, but failed to score and fell by an 8-2 count. Billups was the winning pitcher for WHS, striking out five batters in a complete game, while allowing two earned runs on six hits and three walks. Lunsford tossed a complete game for Trimble, allowing eight earned runs on 10 hits and a walk, while striking out two. Rose and Maddy VanMatre both went 2-for-3 with a double, with Rose scoring twice and VanMatre driving in two runs. 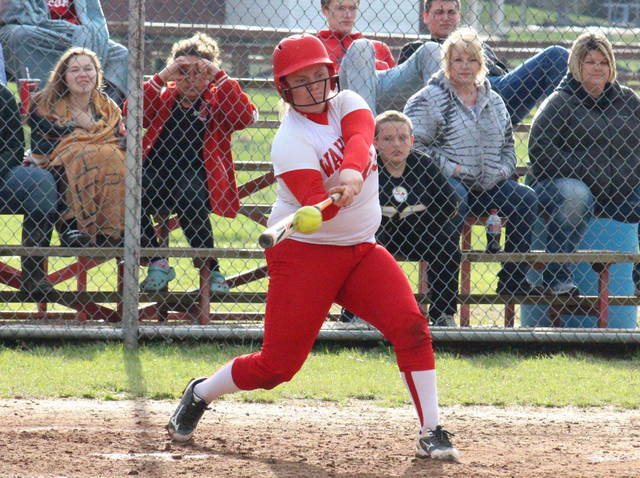 Gibbs was 2-for-4 with two runs and two RBIs, while Emily VanMatre and Victoria VanMatre both doubled once and scored once, with Emily VanMatre driving in one run. Eades and Billups were both 1-for-3 with an RBI, while Haddox and Alison both scored once for the Lady Falcons. Rose stole a game-best three bases in the win. Moore led the THS offense with a double, a single and an RBI, while Hardy added a double. Brown, Cooper and Williams each singled once for the Lady Tomcats, with Lackey and Murphy both scoring once. Neither team recorded committed an error in the contest. Wahama left three runners on base, while Trimble stranded five. 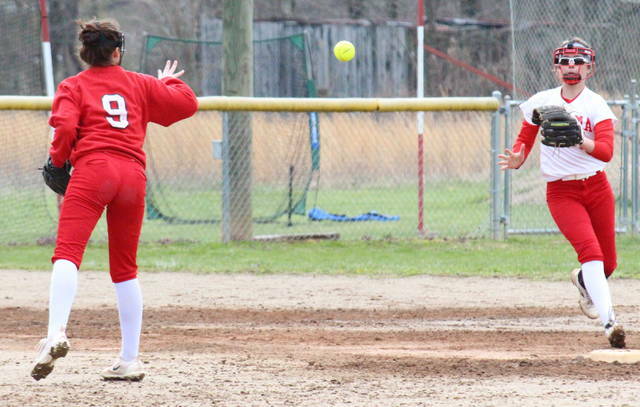 The Lady Falcons and Lady Tomcats are scheduled to clash again on April 19 in Glouster. After visiting Waterford on Tuesday, Wahama will head to Buffalo for non-conference clash on Wednesday. Alex Hawley can reached at 740-446-2342, ext. 2100.